Tensions are running high in Turkey's largest city, Istanbul, between supporters of President Recep Tayyip Erdogan and those of the main opposition party, which dealt a heavy blow to the ruling AK Party in local elections at the weekend. Erdogan's AKP, in power for the past 17 years, saw its grip on the country's main cities severely weaken in the March 31 poll, losing control of capital Ankara and of the third biggest city, Izmir, to the Republican People's Party (CHP). But Istanbul, the country's commercial hub and biggest city, remains a battleground for the two parties, which have both claimed victory. Euronews' team in Turkey experienced the tension first hand when a fight broke out as they were interviewing a CHP supporter on the Bosphorus waterfronts, a traditionally liberal neighbourhood. "When I voted I considered my two children's future, just as I always had — especially in the last two elections," the CHP voter told Euronews. But the interview was cut short by AKP supporters, who accused our team of provocation. Things escalated, voices were raised, punches thrown and our journalists quickly left to seek refuge in a nearby coffee shop. You can watch our team's report in the video player above. "It's really unusual that something like that would happen in that neighbourhood because it's so liberal," Euronews' Emily Wither said. "But with the results so close, people are a bit jumpy. Foreign media, in particular, is viewed very suspiciously here in Turkey," she added. Official results gave CHP's mayoral candidate in Istanbul, Ekrem Imamoglu, a narrow lead over the AKP, which blamed irregularities and said it would contest. Both parties have placarded the city with posters claiming victory and thanking the inhabitants for their trust. Guler Oguz, a seed seller, blamed Erdogan for the country's economic woes. "The President, of course, the President, who else can it be? He's responsible," she said. For PR worker, Tulay Samci, "there are many people that are so unhappy with the changes" brought in by the AKP. 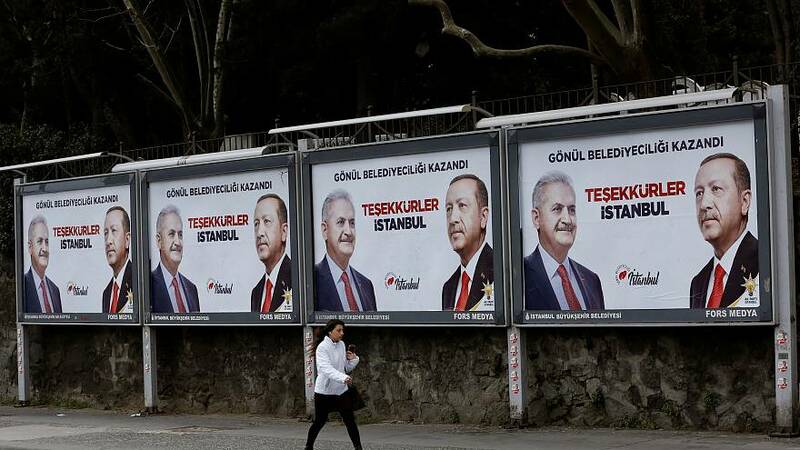 Read more: Why have Turkey's local elections become a key national battle? "For 17 years, AKP has changed all the systems, all the structures that belong to the state, the beliefs and the values that Turks are used to," she explained. But many remain steadfastly loyal to Erdogan. Muhammet Ekinci, a young waiter who cannot remember a time when AKP was not in power, told Euronews: "the main reason I support the AK Party is because of Recep Tayyip Erdogan, as I always say and I never hesitate to say it." "It's also because if their policies," he went on. "For example, we have sisters and mothers wearing headscarves and they are supported in doing this."